What a wonderful Scripture scene to meditate on this Advent. I have always considered this pericope to be the most pro-life passage in the entire Bible. Consider what was happening at that moment. At first, we see that Luke recounts a joyful reunion between two blessed women, Mary and Elizabeth, who lovingly share the news of their pregnancies. But if we take a deeper look, we also see that Luke narrates a joyful meeting between two unborn children. Indeed, John the Baptist, an unborn child, leaps in the womb of his mother Elizabeth because he is in the presence of his Lord and Savior Jesus Christ, another unborn child in the womb of Mary. Is there any doubt that Scripture recognizes unborn children as full and distinct persons in the eyes of God? And is there any doubt that one of those unborn children was, at that very moment, the Savior of the World? But sadly, the way we treat people here on earth is often at odds with how God would have us behave. And while the personhood of Jesus and John is clearly recognized in the Word of God, the lives of so many unborn children in our country today are in severe jeopardy. Due to the pressures of our sinful world, including teen pregnancy, poverty, substance abuse, and ignorance about child development in the womb, we as a nation often choose abortion as the remedy for God’s gift of life. Since the 1973 decision, more than 55 million children have been aborted in the United States, with 1.2 million abortions performed in just the last year. Statistics tell us that over 95 percent of those abortions were performed on children with no suspected fetal abnormalities. 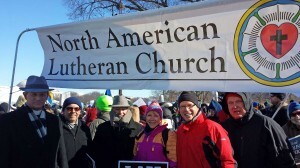 Members of the North American Lutheran Church were among tens of thousands of people who took part in the 2014 annual March for Life in Washington, D.C. Pictured here are, from left, Pastor James Lehmann, Pastor David Wendel, Pastor Mark Chavez, Pastor Rebeca Heber, Bishop John Bradosky, and James Hansen. The North American Lutheran Church seeks to stand up to the national tragedy of abortion by supporting women in crisis pregnancies with Christian love and support. This outreach to women in difficult circumstances needs to take place in our communities, our congregations, and through our local pregnancy centers. We also seek to stand up in Christian witness to our elected representatives who allow the national policy of abortion-on-demand to continue unabated: members of Congress who refuse to restrict abortion even in the third trimester and who give Planned Parenthood of America, the nation’s largest abortion provider, over $500 million in taxpayer subsidies every year. Last year, Bishop John Bradosky and Pastor David Wendel attended the National Memorial for the Preborn and their Mothers and Fathers at D.A.R. Constitution Hall in Washington, D.C., an ecumenical service which prays for the end of abortion and celebrates those who work for alternatives to abortion. In January, the NALC Executive Council will be holding its meeting in Washington, D.C., so that they and our executive staff can participate in the pro-life events there. Members of NALC congregations are also invited to participate in the 2015 March for Life, which will be held on Thursday, Jan. 22, in Washington, D.C. The march will take place on the 42nd anniversary of the U.S. Supreme Court’s Roe v. Wade decision which made abortion legal in all 50 states. NALC members who plan to participate in the March for Life are asked to notify Pastor Dennis Di Mauro of Trinity Lutheran Church in Warrenton, Va., and president of Northern Virginia Lutherans for Life, at dennisdimauro@yahoo.com or 703-568-3346. For more information about the three events, visit marchforlife.org, nationalprayerservice.org, and lcms.org/events/lifeconference.